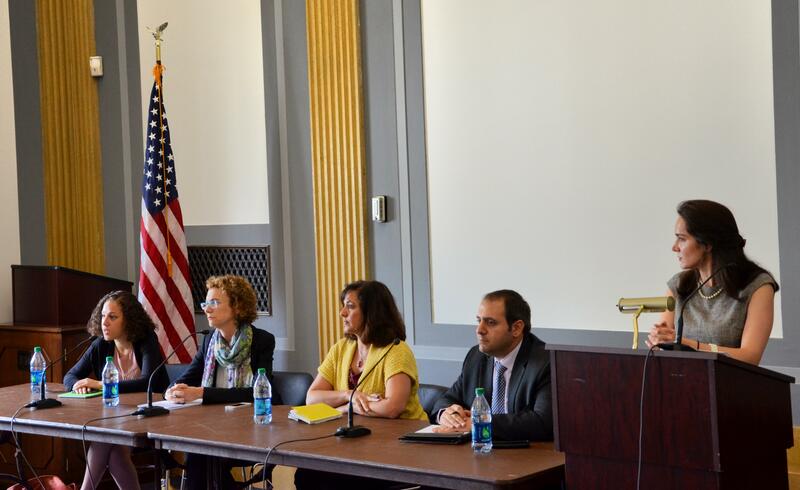 On May 21, 2014, the US Campaign and a diverse group of organizations held a congressional briefing to raise awareness about Israel's discrimination against U.S. citizens. Below are the testimonies from the briefing. This briefing closely examined Israel's treatment of U.S. travelers as it relates to the Visa Waiver Program, U.S. - Israel treaty obligations, and American civil rights. Two pieces of legislation currently before congress, the United States-Israel Strategic Partnership Act and the Visa Waiver for Israel Act, call for Israel's entry into the U.S. Visa Waiver Program, which would allow Israelis to visit the U.S. for up to 90 days without obtaining a visa. Over the last few decades, Israel has maintained a policy of discriminating against many U.S. travelers, particularly Americans of Arab or Muslim heritage. The State Department recently expressed concern about Israel's unequal treatment of U.S. citizens and there are some indications that language seeking to codify Israel's discriminatory policies will be removed from the legislation. Nonetheless, Members of Congress should be challenging Israel's discrimination against U.S. citizens rather than rewarding it with entry into the U.S. Visa Waiver Program. Yousef Munayyer is Executive Director of The Jerusalem Fund and its educational program, The Palestine Center. Prior to joining the Palestine Center Munayyer served as a Policy Analyst for the American-Arab Anti-Discrimination Committee (ADC), the nation’s largest Arab American membership organization. Sandra Tamari is a Palestinian American community organizer with the St. Louis Palestine Solidarity Committee. She serves on the Steering Committee of the U.S. Campaign to End the Israeli Occupation and is active with Quaker peace and justice efforts. Sandra was imprisoned and banned from entry by Israel in May 2012 when she landed in Tel Aviv to participate in an interfaith study delegation. Donna Nevel is a community psychologist, educator, and writer whose work is rooted in Participatory Action Research (PAR) and popular education. She serves on the board of Jewish Voice for Peace, has been a long-time organizer for Palestinian-Israeli peace and justice, and works with groups to challenge Islamophobia and anti-Arab racism. Nour Joudah has a Masters of Arts in Arab Studies from Georgetown University. Nour was living and teaching in Ramallah prior to a re-entry denial, and subsequent ban from traveling to Palestine-Israel. Nour is currently living and working in Washington, DC as the Assistant Editor at the Journal of Palestine Studies. Mark your calendars! The We Divest Campaign has called for a national day of action on July 9, which marks the 10 year anniversary of the International Court of Justice’s historic ruling declaring Israel's wall on occupied Palestinian land to be illegal. Below are materials to help with planning your day of action. 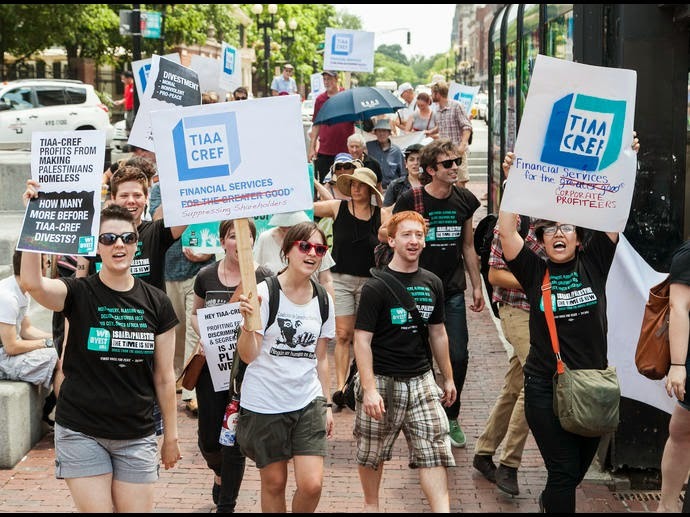 Go to your local TIAA-CREF office. Head or to a place where one of our target companies has corporate offices or sells products. Focus on the company Elbit, in solidarity with Stop the Wall's month of action. Do a BDS tour: march around town to various stores that sell products from target companies. Go to a public place where there’s lots of foot traffic! Don’t have a local group? No problem. Take action online by joining our social media team to be on call on July 9th. Want to dance in a Pink Floyd-parody flash mob? Below are lyrics, here is a recording of the song, and email info@wedivest.org for a video of the dance! Want to connect with activists planning actions in other cities? Save the date for a national planning call on Monday, June 23, at 8:00pm EDT/5:00pm PDT. Will your group participate? Email info@wedivest.org to let us know! Hey, T-Cref, leave them kids alone! Hey, T-Cref, your dollars flatten homes! Hey, T-Cref, look how apartheid's grown!